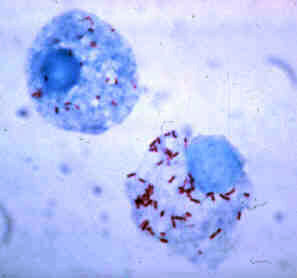 In the past, rickettsioses were considered to be caused by species of Rickettsia. However, scrub typhus is still considered a rickettsiosis, even though the causative organism has been reclassified from Rickettsia tsutsugamushi to Orientia tsutsugamushi . 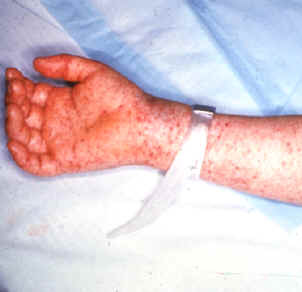 Examples of rickettsioses include typhus, both endemic and epidemic, Rocky Mountain spotted fever, and Rickettsialpox. ↑ Choi YJ, Jang WJ, Ryu JS, et al. (February 2005). "Spotted fever group and typhus group rickettsioses in humans, South Korea". Emerging Infect. Dis. 11 (2): 237–44. doi:10.3201/eid1102.040603. PMC 3320442 . PMID 15752441. ↑ Raoult D, Roux V (October 1997). "Rickettsioses as paradigms of new or emerging infectious diseases". Clin. Microbiol. Rev. 10 (4): 694–719. PMC 172941 . PMID 9336669. ↑ Paddock CD, Finley RW, Wright CS, et al. (November 2008). "Rickettsia parkeri rickettsiosis and its clinical distinction from Rocky Mountain spotted fever". Clin. Infect. Dis. 47 (9): 1188–96. doi:10.1086/592254. PMID 18808353. ↑ Parola P, Paddock CD, Raoult D (October 2005). "Tick-Borne Rickettsioses around the World: Emerging Diseases Challenging Old Concepts". Clin. Microbiol. Rev. 18 (4): 719–56. doi:10.1128/CMR.18.4.719-756.2005. PMC 1265907 . PMID 16223955. ↑ Unsworth NB, Stenos J, Faa AG, Graves SR (July 2007). "Three Rickettsioses, Darnley Island, Australia". Emerging Infect. Dis. 13 (7): 1105–7. doi:10.3201/eid1307.050088. PMC 2878210 . PMID 18214193. ↑ Angelakis, Emmanouil; Richet, Hervé; Rolain, Jean-Marc; La Scola, Bernard; Raoult, Didier (2012). "Comparison of real-time quantitative PCR and culture for the diagnosis of emerging Rickettsioses". PLoS Neglected Tropical Diseases. 6 (3): e1540. doi:10.1371/journal.pntd.0001540. ISSN 1935-2735. PMC 3295807 . PMID 22413026. ↑ Giulieri, Stefano; Jaton, Katia; Cometta, Alain; Trellu, Laurence T.; Greub, Gilbert (February 2012). "Development of a duplex real-time PCR for the detection of Rickettsia spp. and typhus group rickettsia in clinical samples". FEMS Immunology and Medical Microbiology. 64 (1): 92–97. doi:10.1111/j.1574-695X.2011.00910.x. ISSN 1574-695X. PMID 22098502. ↑ "eMedicine - Rickettsial Infection : Article by Mobeen H Rathore".